The series will be launched at an event scheduled to take place on August 17. The news regarding the launch is officially confirmed. The company has unveiled the specifications and the price of the device but no launch date. Scroll down and read more information about it below. ”Asus Zenfone 3 is an agile, exquisite design inspired by the beauty of nature. A glass-and-metal wonder that capture the world with absolute clarity. An extraordinary smartphone for a life less ordinary”. 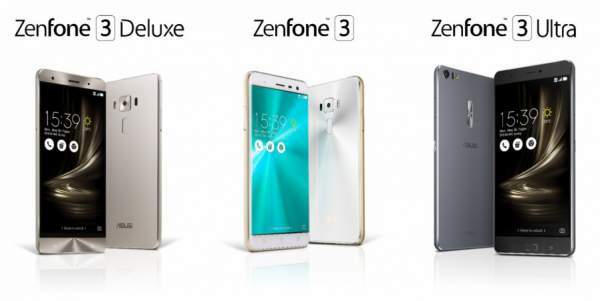 Zenfone 3 series is ready to shake the market with its extraordinary features and a common range of price. Over the specifications, Zenfone 3 comes with 5.5 inches full HD Super IPS display with a resolution of 1080 x 1920 pixels. The device is powered by a FinFET based technology based Snapdragon 652 SoC chipset, operates on Android 6.0.1 Marshmallow based on ZenUI 3.0 OS. The device comes with a 32 GB/ 3 GB and 64 GB/ 4 GB variants. The device is powered by a 3,000 mAh battery, 16-megapixels rear camera with dual LED flash, laser auto-focus, and 8-megapixels front camera. The device also features metallic body and fingerprint sensor. The device is priced around $249 (around Rs. 16,800). Zenfone 3 Ultra specs include a 6.88 inches full HD display with a resolution of 1080 x 1920 pixels with a pixel density of 324 PPI. The device is powered by a Qualcomm Snapdragon 652 processor chipset, operates on Android 6.0.1 Marshmallow based on ZenUI 3.0 OS. The device comes with a 32GB / 64GB / 128GB internal memory variants which can be expandable up to 256 GB via mediaSD card and 3GB /4GB RAM variants. The device is powered by a 4,600 mAh battery, 23-megapixels rear camera with f/2.0 aperture, dual LED flash, laser auto-focus and 8-megapixels front camera with an aperture of f/2.0. The device also features an aluminum body and fingerprint sensor. The device is priced around $479 (around Rs. 32,200). Zenfone 3 Deluxe specs include a 5.7 inches full HD Super AMOLED display with a resolution of 1080 x 1920 pixels with a pixel density of 386 PPI. The device is powered by a Qualcomm Snapdragon 820quad-core processor chipset, operates on Android 6.0.1 Marshmallow based on ZenUI 3.0 OS. The device comes with a 64 GB/ 128 GB/ 256 GB internal memory variants which can be expandable up to 256 GB via mediaSD card and 4 GB/6 GB RAM variants. The smartphone is powered by a 3,000 mAh battery; 23-megapixels rear camera with aperture f/2.0, dual LED flash, laser auto-focus and 8-megapixels front camera. The camera also features 4-axis optical image stabilization,1/2.6” sensor size and face detection autofocus. The device also features an aluminum body and fingerprint sensor. The phone is priced around $499 (around Rs. 33,600). These are the specifications which might have blown your mind but these devices are not yet launched. Let’s wait for their launch which is just a few weeks away.